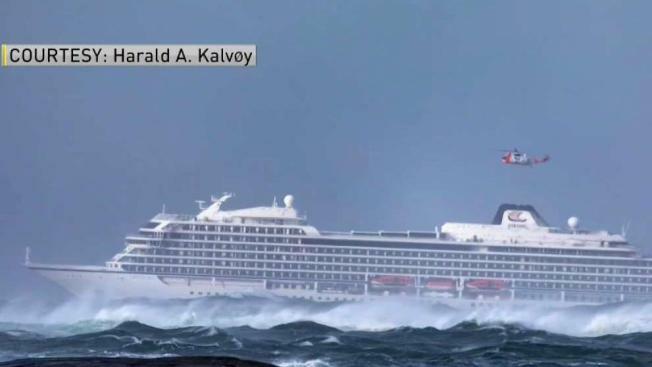 Viking Ocean Cruises, the company that owns and operates the ship, said 20 people were injured "as a result of this incident"
Viking Sky cruise ship passenger Rodney Horgen can pinpoint the moment when he thought he was facing the end: when a huge wave crashed through the ship's glass doors and swept his wife 30 feet across the floor. Coast guard official Emil Heggelund estimated to the VG newspaper that the ship was only 328 feet from striking rocks under the water and 2,950 feet from shore when it stopped and anchored in Hustadvika Bay so passengers could be evacuated. Yet waves up to 26 feet high were smacking into the ship, making it impossible to evacuate anyone by boat.